The 1960s were a time of social activism, with the idea of “changing the world” a prevalent way of thinking. 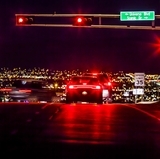 It was a decade of revolution that shaped many – including Dr. Barbara McCrady, Distinguished Professor of Psychology and the director of The University of New Mexico’s Center on Alcoholism, Substance Abuse, and Addictions. As an undergraduate biology major at Purdue University, McCrady was looking for her calling. She became a lab technician in a developmental neurobiology lab, thinking that the results of the research would one day make a difference in the lives of others. 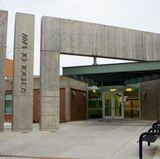 However, after taking an abnormal psychology course McCrady began to see that psychology provided a different avenue to foster individual health and improve the lives of others. “I really wanted to do something with immediate social impact,” she said. 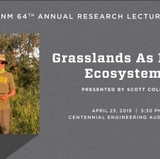 Now, more than 45 years later, McCrady is being recognized as UNM’s 63rd Annual Research Lecture recipient, one of the highest honors the University bestows on its faculty. This selection is made by the UNM Research Policy Committee and through nominations from peers across the United States and abroad. 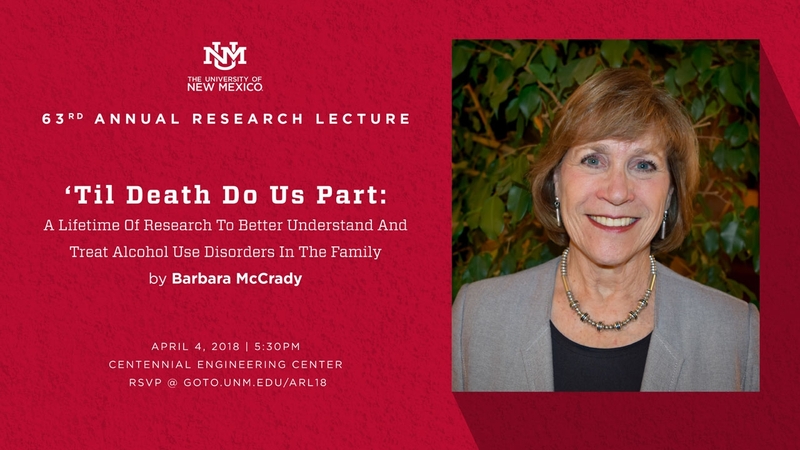 As part of the ARL honor, McCrady presents a lecture, “Til Death Do Us Part: A Lifetime of Research to Better Understand and Treat Alcohol Disorders in the Family,” on Wednesday, April 4 in the Centennial Engineering Center. The event starts at 5:30 p.m. A reception follows afterward. To RSVP, visit: ‘Til Death Do Us Part: A Lifetime of Research to Better Understand and Treat Alcohol Disorders in the Family. McCrady specializes in research on the treatment of alcohol and drug problems, with a particular emphasis on families and support systems in general. Much of her career has been devoted to examining Alcohol Behavioral Couple Therapy (ABCT), which she developed. It is now the standard treatment for couples when one of the individuals has an alcohol use disorder (AUD). 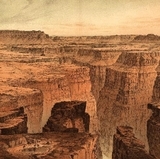 McCrady conducted several controlled clinical trials of ABCT, beginning in the 1970s, which was a time when the spouses of persons with alcohol problems only had one choice for themselves: Al-Anon. As a graduate student, McCrady studied families and family theories as a social context in which people solve problems. Her research in the alcohol field started when a former colleague who received a grant to develop a family involved alcohol treatment for people, and asked her to design a research evaluation of the treatment. Since then, McCrady’s research has led her to understand a lot about alcohol and physiology, social issues, the brain, and mental health problems. She has dedicated her career to improving treatments for persons affected by AUD and other drug problems through the development of empirically supported treatments. In addition to her work on conjoint therapy, she has tested other approaches that involve the social network, cognitive behavioral therapy, mutual help groups as well as therapies for women. Her research has focused on both outcomes research and mechanisms of change in therapy. “Our therapy is data-driven,” said McCrady. “We’ve found that it’s best to engage families and couples from the beginning. We see better outcomes, which flies in the face of other treatment and recovery approaches. We’ve also found that when couples work together on drinking issues they learn to cope with other life problems as well. Predominant models have seen family members as disturbed in their own right, but the research tends to contradict this idea McCrady says. “Families are in a chronically stressful that they don’t know how to cope with, and often experience a lot of depression and anxiety,” McCrady said. Her recent projects involve examining the active ingredients of ABCT, the importance of addressing the couple’s relationship as part of treatment and its mechanisms of change. McCrady is also developing an abbreviated version of ABCT to improve dissemination of the treatment and is collaborating with colleagues at the University of Massachusetts on NIH-funded grants adapting ABCT for work with heavy drinking military personnel. She is also assisting with the development of a smartphone app for the family members of individuals with DWI arrests.